Majorca passenger and car ferry ticket prices, timetables, ticket reservations and information for ferries sailing from Majorca to Barcelona, Denia, Ibiza, Mahon and Valencia. Compare all available Majorca ferry ticket prices in real time and book the cheapest available Majorca car and passenger ferry tickets sailing to and from Majorca, Barcelona, Denia, Ibiza, Mahon and Valencia with Acciona or Balearia Ferry Line ferries online with instant confirmation. Book Majorca Ferry Tickets with Acciona or Balearia Ferry Line for ferries sailing from Majorca to Barcelona, Denia, Ibiza, Mahon and Valencia online in advance to enjoy the cheapest available ferry ticket price. The price you see is the price you pay. There are no hidden extras or surprises such as added fuel surcharges or booking fees and we do not charge you anything extra for paying with a Visa Electron card. The price we quote you for your selected Majorca passenger or car ferry ticket, onboard accommodation and vehicle type is all you will pay, and that's a promise. To obtain a Majorca ferry ticket price and book your ferry ticket securely online please use the real time ferry booking form on the left. You are also able to add a hotel at your destination, or anywhere else, to your ferry ticket when completing your ferry ticket reservation. Majorca, one of the foremost Balearic Islands, is ready to welcome millions of tourists from all over the world. It is famous amongst travellers because of the ever growing greenery, water reforms and landscapes. Visiting Mallorca is just like residing in a paradise, which is truly engraved by God's hands. This island is ideally placed in the lap of the Mediterranean Sea where you have ample chances to explore the untouched locations, sites and attractions. The island comprises of seven cities, the capital being Palma where the majority of population resides. Cities and quaint towns in other regions such as Palma de Mallorca, Pla de Mallorca, Raiguer, Migjorn and Llevant also attract a fair share of tourists. Check out the top things to do, if you are planning to visit Majorca in the future. Make sure that you have gone through detailed information if you are a newbie and want to have great time on the island. Peak season runs from June to September and enjoys the highest temperatures. Summer is the best time to catch popular music and film festivals that run in June and July. Autumn is the best time to visit if you want to avoid the crowds, and the temperatures is still warm. Even in Winter temperatures don’t drop below 10 degrees. Majorca caters for any night out you could possibly be after. For the more eccentric and crazed party-goers amongst you, look no further than Magaluf’s Punto Ballena strip. With an assortment of bars to choose from we recommend purchasing a Magaluf Club Pass for 12 euros – which will allow you entry into 5 of the best bars for the night (or morning, as it shall no doubt turn into). If your ideal night does not consist of boogying into the early hours, then Majorca offers more relaxed nights out. If experiencing local traditions is an important part of your holiday, we recommend Alcudia’s Old Town consisting of narrow, quaint streets home to lots of beautiful authentic restaurants. Why not walk around the walls of the old town and discover the century-old bullring and watch a mock fight (no bulls will be harmed in the making of this experience)! If you prefer your nights out to be more British, Majorca also caters for you, providing a place to drink pints of bitter, watch the football on satellite TV, and even sit down at a restaurant that serves genuine fish and chips. A Majorca holiday offers British home comforts (but with much nicer weather). Majorca really does have something for everybody. Majorca has a selection of gorgeous beaches off the beaten track, but we won’t tell you where otherwise they wouldn’t be secret! Why not strike up a conversation with a local and see what you can find? One of the most thriving industries in Majorca is leather and footwear, so if you are looking to expand your collection, Majorca is the perfect opportunity to buy cheap well-made goods. Sometimes those fondly known as ‘looky looky’ men may approach you in the street. Don’t barter with them– their products are not genuine and they sniff out a flicker of interest very easily. Instead try one of the many markets in Majorca, notably Alcudia every Tuesday and Sunday. Be prepared to leave your British politeness behind on entry into the market, and haggle your heart out to secure the best bargains! Majorca has all sorts of food on offer to leave you nice and full up. From English breakfasts to Chinese takeaways – Majorca has it all. Prices are roughly £12 per person for a three course meal. Local villages in Majorca also grow wine, so why not try out the local vino at great prices? (Around £7.50 for a bottle). On average a set menu at somewhere classy like C’an Cuarassa, a Michelin restaurant in Puerto Pollensa, is around £25, and worth every penny. If you want to experience the authentic taste then why not try a tapas bar and befriend the locals? If you prefer to knock up your own culinary delights, there are a range of supermarkets that offer all the comforts of home, but expect to pay more because strangely, the local Majorcan villages don’t grow Pot Noodles. Over recent years Majorca has grown into a hugely popular destination. Whether your plan is to soak up the culture or top up your tan, lowcostholidays.com’s insider tips will ensure you are kept in the know on your next holiday. Best Price Guarantee - We always offer you our lowest available Acciona or Balearia Ferry Line passenger and car ferries ticket price to and from Majorca. There are no hidden extras or surprises such as added fuel surcharges or booking fees and we also we do not charge you anything extra for paying with a Visa Electron card. The price we quote for your selected Majorca ferry ticket, onboard accommodation and vehicle type is all you will pay, and that's a promise! In the unlikely event you find the same all inclusive Majorca ferry ticket cheaper in the brochure of any other tour operator we promise that we will do our best to beat that price or offer you the choice of requesting a refund. 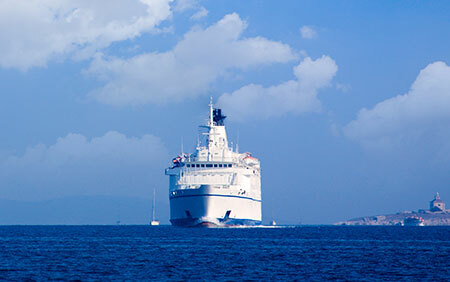 To book Majorca car and passenger ferry tickets please click here. At ferryto.com you are able to obtain live Majorca ferry ticket prices, check availability and book car and passenger ferry tickets to and from Majorca at our lowest available ticket price. Ferryto.com is part of the world's largest online ferry ticket distribution network providing the ability to book over 80 major European ferry operators including to Majorca and to over 1,200 other ferry routes throughout the UK, France, Spain, Ireland, Holland, Eastern Europe, the Mediterranean, the Baltic and North Africa.